Here are some House Ads & Flyers to Promote Community Papers! Attached is a PDF containing several ads that you can use in your paper promoting the value of Community Papers compared to daily papers. These ads will also make great flyers/hand-outs for your Sales Team. 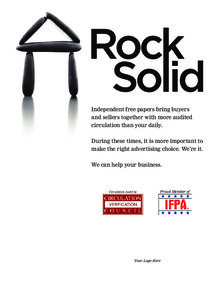 If you have ads or flyers of your own that you’d like to share please email them to us and we’ll get them loaded onto the IFPA website right away.